LVIV, Ukraine -- UEFA president Michel Platini on Wednesaday said he believed Ukraine were on track to co-host Euro 2012 with Poland as he began a two-day visit. 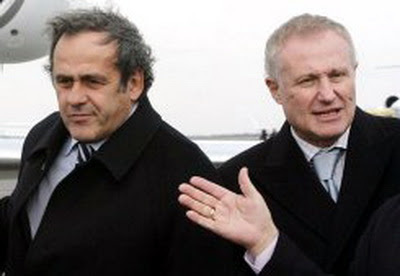 UEFA President French Michel Platini (L), seen here with Ukrainian Football Federation President Grigory Surkis in Donetsk, said he believed Ukraine were on track to co-host Euro 2012 with Poland as he began a two-day visit. "We believe in Ukraine ... we believe in the authorities," former France star Platini said as he arrived in the city of Lviv, one of four host cities in the country. The city is having a new airport terminal and a new stadium built and local authorities insist that, despite several stadium construction delays, they will be ready in time. Platini, who last month insisted discussions would be "frank and serious," was later to visit the eastern industrial city of Donetsk, which last year saw an impressive new stadium erected, before going on to Kharkiv and the capital, Kiev. The UEFA head was also due to hold talks with new Ukrainian President Viktor Yanukovych. Amid doubts as to Ukraine's capacity to be ready, Platini recently suggested that matches could be held in four Polish venues and only two in Ukraine.